For many years, stories have been passed down from generation to generation about hairy, man-like creatures who roam forests around the world. Tribes who came to respect these creatures’ territory had many names for these dwellers of the forest that include Bigfoot, Sasquatch, and Mesingue. Beatty and Ray share interesting facts about the creatures of the forest that encourage children to safely explore nature while searching for clues and evidence that can potentially change opinions in the scientific community regarding the validity of the Sasquatch. The authors provide information regarding the habits of the creatures, how they interact, and what young researchers should bring along while searching for them. 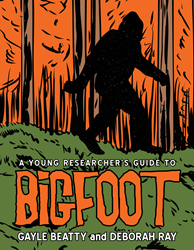 In this comprehensive guidebook, two experienced Bigfoot hunters share facts and stories that encourages curious young researchers to venture into the woods and carefully search for evidence that may prove these legendary creatures truly exist. Gayle Beatty first became intrigued by Bigfoot after watching a television show that confirmed stories she heard as a teen while camping. While searching for forest people, she has had much success using a gentle approach and trying new techniques. Beatty is a homemaker, mother, grandmother, hunter, and fisherwoman who loves nature and the outdoors. Deborah Ray investigates calls and sightings in the Hudson Valley, where she gathers evidence and always has her camera ready to capture an interesting occurrence. She is a mother, grandmother, and registered nurse. To learn more, visit http://www.bigfootresearcher.com.